I have so much to share about my #eatprayrunberlin trip this fall. 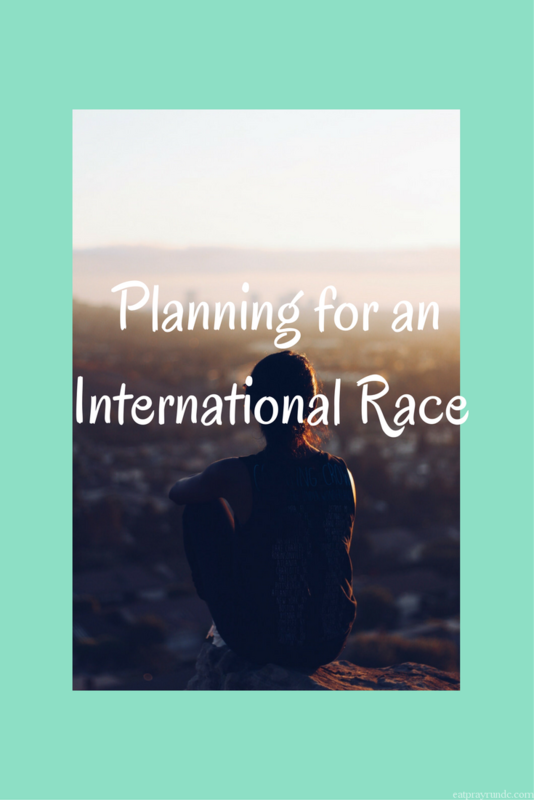 I asked for some feedback about what you all wanted to hear about and many folks said that they wanted to hear about planning to run an international race – what did the logistics look like? I thought then that it made sense for a post on the planning and logistics would be the perfect place to start. I received word that I got into the Berlin Marathon on November 30, 2016. I began stalking flights and reading all I could about Berlin and Germany in general. My general strategy was to buy flights first and then figure everything else out from there. A big source of debate for me was where else to go during the trip. Initially the plan was that this was going to be a big vacation for my husband and I. However, he ended up not being able to go so it also meant that this would be my first big international trip and portions of it would be solo (I knew a bunch of gals running Berlin, so knew I’d have friends to hang with there). I love planning and research so I began in earnest. I’ll share a bit about how I approached each aspect below. I knew that the flights would be the biggest cost of this trip. I originally targeted April as my deadline to buy flights, but it took me awhile to decide where else I wanted to travel, and that played a part in the flight selection. I paid a few bucks to sign up for Scott’s Cheap Flights. After seeing a few great deals, I finally decided to pull the trigger and purchased a flight from DC to Germany for less than $600. I saved a couple hundred bucks by flying in and out of Munich. With that decision, I decided to end my travels in Munich and figured I’d just buy a cheap flight from Munich to Berlin. I easily bought an AirBerlin flight for less than $100. I knew that I would start my trip in Berlin and end in Munich, but I still had to decide if I wanted to experience another country. I decided I did and settled on Prague. Once I knew that my itinerary would be Berlin / Prague / Munich, it was an easy decision to settle on trains from city to city. There are a ton of options for train travel to and from Germany. I went ahead and purchased my ticket from Berlin to Prague in August through the DeutschBahn website / app. DB is the major train company in Germany and purchasing was pretty easy. I decided that I would wait and decide on my train time from Prague to Munich while I was on the go. I ended up buying my ticket from Prague to Munich at the train station in Berlin. It was very simple. A couple tips on the trains. Make sure you get a reserved seat. You can just purchase a spot on the train with no seat reservation. I do not recommend this. From what I saw, you can have to stand the whole way if you do not have a seat reservation. A seat reservation only costs a few bucks and is well worth it. Your seat will be marked, indicating that it is reserved. Trust me that you definitely want a reserved seat! I bought the Holy Grail of guidebooks – Rick Steves. Every hotel I stayed at came from his recommendations! I highly recommend Rick’s books for travel. Not only did I get great hotel recommendations but I also used his books to help plan what to do. For example, in Berlin, Rick’s book told me about an easy and cheap way to get a great tour of the city without doing one of those big bus tours – I took a city bus and saw so much for only a couple bucks. Pretty great. Rick’s book was probably the biggest piece of planning advice I have for folks. It was well worth the cost – I got so many great tips from his books (I read the Prague book as well). Each hotel I stayed at was incredibly affordable. In Berlin, I stayed at Pension Peters. The hotel was absolutely adorable with the friendliest owners. Pension Peters is located very close to the S-Bhan and in a cute neighborhood filled with cafes and lots of Italian restaurants. 🙂 It is walking distance to the Berlin Zoo and Tiergarten as well. I felt very safe in the neighborhood and appreciated the proximity to Berlin’s excellent transit system and shops, cafes and restaurants. In Prague, I stayed at Hotel Julian. This was my favorite hotel of all three that I stayed in during my trip. Hotel Julian is located is what is known as the Lesser Town part of the city. It is on the same side of the Vltava River as the famous Prague Castle. The wonderful thing about Prague is that the city is so incredibly walkable. The hotel is about a 15 minute walk to the Charles Bridge and very close to a tram stop that gets you just about anywhere you want to be in the city. In Munich I stayed at Hotel Uhland. This hotel is SUPER close to the Oktoberfest grounds. I was a bit concerned when I realized how close it was because I just wanted a quiet place to sleep, but I did not hear much noise in the evenings. I will discuss this more in my Munich specific post, but I did not love the location, especially as a single traveler. But the hotel was lovely. I spent about $1000 on hotels over ten nights. It would have been much less but my Munich hotel was pretty expensive because it was Oktoberfest during my visit. I paid the same amount for three nights in Munich as I did for four nights in Berlin + three nights in Prague. But again, that was because Oktoberfest drives up hotel prices. One of the hardest aspects of logistics for this trip was planning what I would pack for my first racecation that involved an international race. I wrote a more detailed post about how I packed everything I needed into a travel backpack and did not have to check a bag. You can find that post here. The only other thing I will say about packing is if you are checking a bag for an international race, make sure to carry on your race necessities. You do not want to risk the chance that your race shoes, gear, etc. gets lost! I did a few other things to keep myself organized. I created a google drive spreadsheet that listed all my trip details and plans and saved it so I could access it without internet. This included all of my hotel, flight, and train details so I consistently knew where I was going and what I was doing. I also made a copy of my passport and sent it to my parents via email and also carried a printed copy with me while I traveled. Many folks asked about the cost of my trip. I’ve shared the cost of my flight and hotels – around $1600 total. I also spent approximately $150 on train tickets. I paid for the flight, one train ticket and my Munich hotel prior to my trip. I started a savings account for my trip as soon as I got into the race and used money that account (and that account only) to fund the trip. All together – flights, hotel, train tickets, food and drinks and sightseeing, I probably spent around $2200. Many of the sites I saw were relatively cheap and I did not have many fancy meals. There were some extra purchases – gifts for my family and Berlin marathon gear not included in that estimate. Remember, I traveled for ten nights. So altogether, I spent an average of $220 a night for food, lodging and entertainment. I felt happy with that amount and truly, I had such an amazing trip – it was well worth the cost. I will be writing separate posts about my adventures in each city, along with a post about traveling solo as a black woman. If you have any specific questions about my travels, let me know! Do you enjoy the planning part of trips? It’s my favorite – and this anticipation happiness study written about in the NY Times a few years ago explains why! This is post is great. Just randomly decided to enter the Berlin Marathon lottery so if I get in-I’ll probably be bothering you for more tips! Good luck! I hope you get in. It was a great experience and a really fun trip! Really helpful, thanks for sharing! $2200 for the trip is pretty good. I would have thought that 10 nights in Europe would have been more. I scoured for the flights and made smart hotel choices. That made a big difference!! Um, yes, I enjoy planning trips…I will also confess that I have semi-planned trips (just for fun) that I’ve never actually taken. HA! 😉 Thank you for sharing such detailed information and the way the costs panned out for you; I always think it’s so helpful to have an idea (and I love the per night breakdown) for reference so that I don’t go overboard, or spend more than I should, and wonder why my trip was so expensive. Most of all, I”M SO GLAD YOU TOOK THIS TRIP!! I loved seeing all of the pictures and highlights and will be anxiously awaiting more adventurous posts. I’ve done the planning of trips that I’ve never taken too 🙂 such fun! Loved your carry-on only post and actually bought the backpack you used to replace my well worn and no longer waterproof twenty-year-old one. Can’t wait to hear about your experiences in Europe. I’m new here, but reading about your progress to where you are now was so amazing and inspiring and really motivated me (I run similar paces so that post gave me real hope — if I work hard because running will not give me anything for free, it’s all going to be hard work and grit lol!). Did you have problems communicating in Englishon your trip? Thanks – I’m working on posts on my travels now!